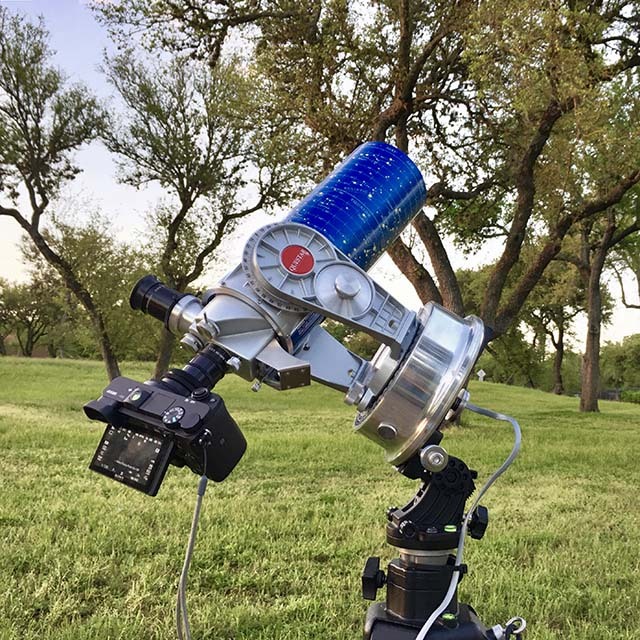 Last year a friend showed me how well the inexpensive Skywatcher Star Adventurer Equatorial Wedge worked with the Questar. 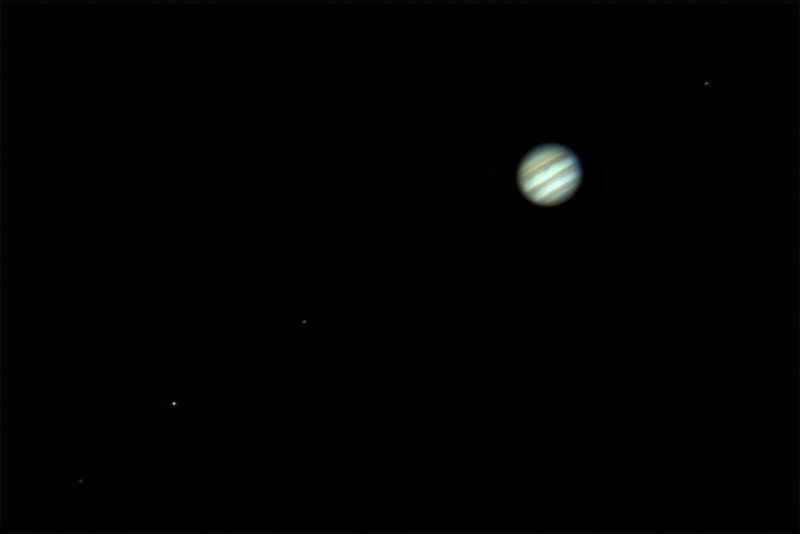 I recently tried the Skywatcher wedge on a Manfrotto 3265 tripod. The combination is more rigid than the wood wedge on the Davis & Sanford compact tripod I used previously - with the image settling in about 1 second from a tap to the eyepiece. Details of my adaptation of the SkyWatcher wedge for the Questar follow. In practice this wedge provides very solid support for the Questar and the fine adjustments work well under load. A heavier duty alternative is the Astrotrac TW3100 Wedge which can handle a 33 lb load. The Astrotrac wedge runs around $400 new; the $69 SkyWatcher wedge is a bargan. After a couple of testing sessions with the Questar, SkyWatcher wedge, and Manfrotto tripod combination, I decided that they were a superior replacement for my wood wedge. I'll miss the shelf for accessories and the large compass and precision level from my wooden wedge. There is no contest with the faster focusing and more rigid mounting that the SkyWatcher wedge / Monafrotto tripod give. The nut locks the thumb nut against the screw head. I ground the end of the screw to a rounded profile similar to the original screw. I used 1/2" heat shrink tubing to cover the long section of unused exposed threads on the replacement locking screw. Compared to my large wood wedge, I found it awkward to mount the Questar to the narrow dovetail bar for every use with a 1/4 x 20 thumb screw. I decided that I wanted to semi-permanently mount the dovetail bar to the Questar's base. This makes mounting the Questar on the head much faster than using the thumb screw. With a dovetail bar sized to the Questar base, only a minor modification of the foam in the case (Pelican 1550) that I use for the Questar is required. I didn't have a dovetail bar the same 7" size as the Questar's base, although they are made in that length by ADM and Losmandy. I used a solid aluminum Celestron CG5 Universal Mounting Plate from B&H Photo. I cut the dovetail bar to fit the Questar base using a cutoff saw with a blade rated for cutting aluminum. I used BW Casey Aluminum Black Touch-up for a black finish on the cut end of the aluminum bar. I attached the dovetail bar to the Questar with a 1/4" x 20 tpi x 5/8" stainless steel socket head cap screw. The CG5 pre-drilled hole is countersunk. If the clamp screw becomes loose, the sunken cap screw head cannot prevent the bar from falling through the dovetail. I added a nylon 1/4 x 20 screw to the threaded hole at the end of the CG5 to prevent this disaster. Clamping the dovetail bar at the rear of the Questar base places the center of weight close to the center axis of the tripod. 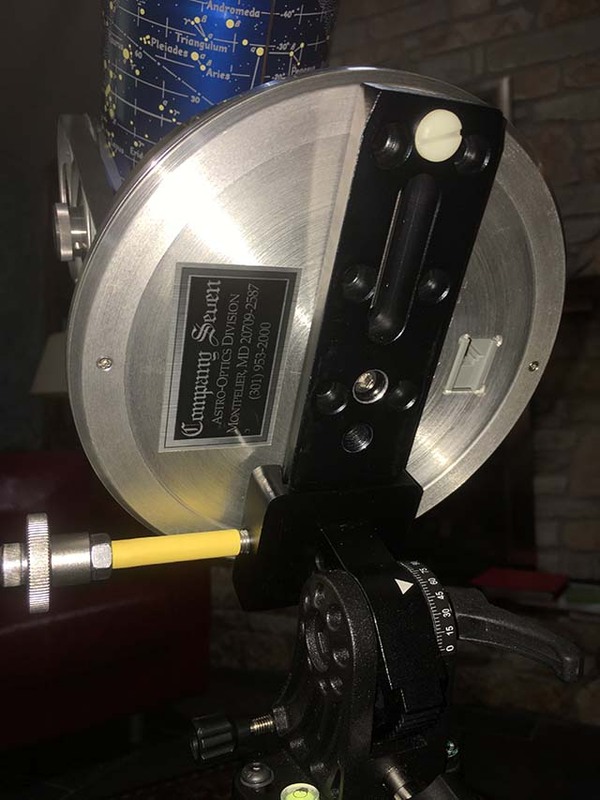 The final modifications to the SkyWatcher dovetail mount for the Questar are shown below. With the Questar supported by just a narrow dovetail bar, I kept the bar short which meant that the balance of the telescope was offset from the center of the tripod. I didn't like having to attach the dovetail bar to the base of the Questar. These problems can be overcome with an adapter plate similar to the one I built for an Astrotrac wedge.